RAI1. In charge of the producer Big Bang Media, Palomar (Il commissario) Montalbano) and RaiFiction. The series Cuéntame cómo pasó (La 1, 2001-) has been adapted with great success in Italy, where it even had a spin off, and in Portugal as well. Besides, producers of several countries such as Turkey, Greece, Argentina and Mexico have also acquired adaptation rights. The title of the Italian adaptation is Raccontami where the Alcántara become the Ferrucci. The narrator in off is, like Carlitos in the original, Carlo, the little brother. On its part, the Portuguese version titled Cont-me como foi is closest to the Spanish one, because the López family lives the difficult years of the dictatorship of Oliveira Salazar and the first years of democracy (Hurtado, 2015). Besides, the series could acquire the title in English of Remember When, because in a notice published on June 2015 the British Producer New Media Vision announced the purchase of the rights of the series Cuéntame cómo pasó for its possible adaptation in the United States. Thus, the executive producer Miguel Angel Bernardeau (El Heraldo, 2015) stated: "We always believed in the international possibilities of the format Cuéntame cómo pasó. When Todd (Todd Lituchy, founder and advisor of New Media, and executive producer of the American version of Los misterios de Laura, The Mysteries of Laura) contacted us with the idea of an adaptation for the United States, we knew it was the adequate one -after its success in adapting Los misterios de Laura for NBC-." This paper is part of the research project (Ref. 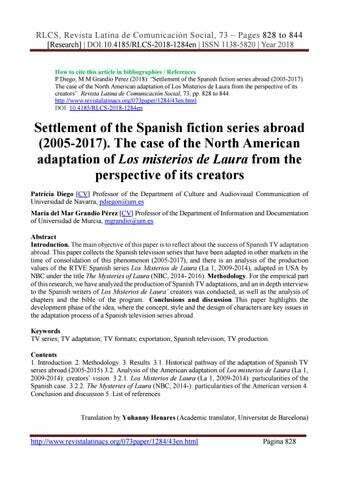 CSO2015-64615-R) “Identification of consumption drivers of fiction and entertainment audiovisual contents in the Spanish market" (2016-2019). Article received on 10 January 2018. Accepted on 21 April. Published on 26 April 2018.